The power of Recep Tayyip Erdoğan appears limitless. It seems the Turkish president will rule forever. The events since last April’s referendum supposedly confirm this gloomy outlook. The vote delivered Erdoğan and his party, the AKP, a crucial victory, ushering in constitutional changes that established an overtly dictatorial system. Purges and repression followed. Yet a closer look reveals that Erdoğan’s would-be dictatorship is anything but stable. All the social contradictions that have simmered under the surface, frustrating the AKP’s attempts to consolidate its political dominance, were manifest again during the referendum. And they haven’t vanished in the months since. Despite the use of state terror and blatant fraud, Erdoğan only managed to win 51 percent “yes” votes in the referendum. No longer able to create mass consent by “soft,” democratic means, he resorted to repression, corruption, and support for jihadist and other ultra-reactionary groups. The crackdown has further antagonized Erdoğan’s opponents in the state and society — they are eagerly awaiting his fall. Erdoğan’s aim is to polarize society, barbarizing political discourse to stoke far-right elements while shoring up his right-wing base. He’s installed some of his most militant and fanatic supporters in media and business posts previously occupied by Gülenists (followers of the exiled cleric and former Erdoğan ally Fethullah Gülen, who Erdogan has accused of fomenting the failed July 2016 coup). But his plan isn’t foolproof. On the one hand, Erdoğan’s aggressive actions could boost the AKP’s right-wing support in both the state and the broader society. On the other hand, there is still a significant share of the AKP voter base that is disillusioned, if not flatly opposed to the authoritarian discourse their party has adopted. Erdoğan is therefore on a tightrope: he must always consider the proper balance between his mass base and the radicalized militant elements, both of which he needs to stay in power. Since the coup attempt in July 2016 — which was quickly put down but which Erdoğan has used as a pretext to consolidate power — more than 150,000 people have been sacked, around 132,000 people have been detained, more than 5,800 academics have lost their jobs, almost 200 media outlets have been shut down, and over 300 journalists have been arrested. Anybody with the potential to foment critical or oppositional activity is at risk of being arrested on the flimsiest of charges and invariably labeled an operative of “FETÖ” (Fethullah Terror Organization) or the PKK (Kurdistan Workers’ Party, a militant Kurdish liberation group). The latest statutory decree, issued in December, grants immunity to civilians who engage or have engaged in (violent) actions to thwart coup attempts. Although government officials have stated that only the night of July 15, 2016 and the following day are covered by the law, its scope is left open to any social event that is regarded as a coup attempt or terroristic. It is clearly a preemptive measure designed to address potential uprisings or civil conflicts, providing pro-government groups and militia with a legal shield. The repression and consolidation of power extends from the street level — demonstration bans, the replacement of Kurdish signs with Turkish, etc. — to the commanding heights of political life. The heads of the country’s highest courts are bowing before Erdoğan or at least supporting him politically. But this alone is not enough. The submission of the judiciary and the state to the president has to be structural and legal rather than personal. So slightly less than half of the Supreme Board of Judges and Prosecutors have been replaced. Five of the board’s newly elected members were nominated by the AKP, and the other two by its fascist ally, the MHP (Nationalist Movement Party). Similarly, according to one member of parliament, 90 percent of the 1,341 open posts in judge’s and prosecutor’s offices were filled with people with a direct or indirect relationship to the AKP’s local organizations. All high-level state bureaucrats are now being chosen (if not appointed) by the president. In the educational arena, the system is being imprinted with a more conservative Islamic tint. Last summer, the ministry of education removed all passages about evolution from schoolbooks and added sections on jihad as well as the struggle against FETÖ, the PKK, and the coup attempt. Mixed dorms at the high school and college levels have been disbanded. Erdoğan is also establishing more control over the intelligence agency and military, concerned that the army — traditionally an opponent of political Islam in Turkey — isn’t sufficiently faithful to him. Internal surveys taken after the coup attempt indicate that the Islamist faction is indeed weak in the army’s higher ranks. And while there is some support for Erdoğan himself, the share of those who voted “no” in the referendum is exceptionally high. Hence the relative autonomy of the Intelligence Agency and military is set be abolished or minimized through their gradual subjection to the president. The most important step in this regard was taken last August. The Intelligence Agency is now directly tied to the presidency and granted the power to investigate within the military and dismiss any of its staff members. Standards have been lowered for military promotions. The military judiciary system has been completely eliminated. The legal procedures within the army have been handed over to civilian courts and prosecutors. Finally, for the first time in history, the president and government had a greater say than the army in the Supreme Military Council (YAŞ) that took place in August. The YAŞ makes all the promotion decisions in the army. New cadres were appointed to all supreme commander positions, partially in conflict with seniority rankings. Meanwhile, ultranationalist elements, who had been purged from the army and partially imprisoned by Gülenist cadres, are returning to fill the gaps left by the Gülenists after the coup attempt. To what extent all these developments will lead to the establishment of Erdoğanists within the army or rather restore the typical nationalist pro-NATO bloc — as well as how they will affect the army’s combat strength — remain an open question. But what is clear is that Erdoğan has established much more power over the state and society. These two processes are very much in play in Turkey, and both are at once products of, and catalysts for, the AKP’s hegemonic crisis. In time, it became clear that Erdoğan was more troubled by the referendum results than it initially appeared. It was necessary, he argued, to draw lessons from the mistakes made in the referendum. To underscore his argument, he conjured up the idea of material fatigue. During the fifteen-year reign of the AKP, Erdoğan said, a certain weariness had crept into the party cadres. Whatever their successes in the past, many were no longer reliable. This was not empty talk: many cadres were forced out, and some AKP mayors of important cities were compelled to resign. But the idea of a material fatigue is both a myth — the measures were aimed at bringing in younger cadres completely loyal to Erdoğan, not necessarily more competent ones — and an attempt to hide deeper structural problems. The referendum was won by fraud, and only narrowly; social resistance is continuing despite all the repression. The upshot is that the political and economic costs of the fascization process are increasing and international isolation is advancing. This has stoked insecurity and irritation among the AKP cadres and their party intellectuals. And replacing veteran cadres with younger ones will do nothing to change that. On the contrary: eliminating even mildly dissident voices from the AKP will deepen the crisis. There is serious upheaval within the Islamic camp, broadly defined. Those occasionally advocating for a “softer” approach within the AKP have been either purged or driven out of the party and the state. Heavyweights such as AKP co-founder and former president Abdullah Gül as well as former Prime Minister Ahmet Davutoğlu are leading figures of this front. They criticize the coalition with the MHP and favor improving relations with the West, continuing serious talks with the European Union, and overall advancing a more “liberal” politics. Looking outside this camp, reactionary and fundamentalist journalists and religious intellectuals are upset that Erdoğan isn’t “Islamic” enough. His alliance with the non-Islamic state bureaucracy has made them increasingly uncomfortable, and those who stand by him have to perform strange twists and turns to legitimize many of his political moves (relations to Israel, Syria, etc.). It is not only the AKP camp and Islamic circles where there is unease and dissatisfaction. The same goes for their de facto coalition partner, the MHP, led by Devlet Bahçeli. The MHP entered into a partnership with the AKP with the hope of landing leading posts in the state bureaucracy, the military, and police forces. The cost was tying themselves completely to Erdoğan, which upset the more nationalist party base. Former leading MHP cadre Meral Akşener has since founded a new formation, IYI Parti (Good Party), and many party members (especially younger ones) are defecting to Akşener or other political associations. Among the fragile alliances that Erdoğan is entertaining in order to secure his own position, there are several groups that are potential “Röhm” factions. The first of these comes from inside the AKP: the Islamist faction. This may seem surprising, given Erdoğan’s own conservative religious politics. But his recent pragmatic turn, which is aimed at reducing Turkey’s international isolation, creating better relations with Israel and ending military and other aid to jihadist groups in Syria was not well received by the Islamists. Ever since Ahmet Davutoğlu’s removal as prime minister, this conflict has been simmering, and often erupted into public view. Representatives from the different camps attack each other in the media and accuse each other of being supporters of “FETÖ.” But for now, this faction has been successfully marginalized. Another candidate is the ultranationalist, fascistic Vatan Partisi (VP). They rival the MHP in their nationalism and hatred of everything Kurdish (and compete with the MHP for ultranationalist supporters), but are staunchly secular. While the VP does not have a large base, their cadres are well placed within the various state apparatuses. It was they who led the effort to reestablish and normalize relations with Russia and Syria. Yet they are far from a strategic ally of the AKP. Rather than simply supporting Erdoğan, they are eyeing power themselves. Whenever they see an opening, they will quickly change course and start to attack Erdoğan and the AKP. A third faction might arise from the state bureaucracy. Many politicians and high-ranking state officials who were deeply involved in the “dirty war” against the Kurdish people in the 1990s are again in influential positions. It is assumed that there is a wide network in place that ranges from right-wing politicians and high-ranking state officials to organized crime. Here it is necessary to highlight one phenomenon very common in fascization processes: supporters of the leader view themselves as “little leaders.” It is precisely this dynamic that makes right-wing and fascistic political movements attractive to some. Many of the “little leaders” in Turkey start to behave with ever more self-assurance. And it is they who are closest to Erdoğan and his most fanatic supporters. To summarize, the liberal-conservative and “soft” wing have largely defected from the party, and many experienced cadres have been driven away for different reasons (“inefficiency,” “material fatigue,” etc.). At the same time, the alliance running the country alongside Erdoğan is quite fragile and all the various allies are dealing with internal contradictions and problems of their own. Two of the issues making Erdoğan sweat: isolation in foreign affairs and the dissatisfaction of big capital. The EU states, particularly Germany, have been rather restrained in their criticism of Turkey. The reason is simple: 80 percent of foreign direct investment in Turkey comes from Europe. Thus, while the AKP government and particularly Erdoğan have become objects of scorn in many parts of Europe and have lost the trust of most EU governments, the involvement and interests of big capital have prevented a stronger posture. But for how long? Turkey’s relationship with the US, meanwhile, is worse than it has been in awhile. After two members of its consular staff were arrested on suspicion of links to the 2016 coup attempt, the US suspended visa services in Turkey, and the latter responded in kind. While both countries have since resumed full visa services, their relationship remains frosty. Another reason for the increasing iciness between the two countries is a New York court case against Reza Zarrab, a Turkish-Iranian businessman who had extremely close ties to the AKP before his 2016 arrest in the US. The main charge against Zarrab is that he engaged in trade with Iran in a scheme to avoid US sanctions and, more importantly, that he was assisted by the Turkish government in bypassing the sanctions. Both the AKP media and Erdogan view the Zarrab case as a political operation against Turkey, and not without reason: It is not improbable that the US government is using the Zarrab case to hit its Turkish counterpart. The US and the West have long been signaling to Turkey that it is overestimating its geopolitical role and power. Although it seems that the consequences for now will be confined to monetary fines to the involved banks, the whole affair should be read as a further warning to the Turkish government. Regarding the Middle East, the lay of the land is as follows: there has been a rapprochement with Iran that has not (yet) brought a united struggle against ISIS. Militias close to Iran are substantially more effective than those close to Turkey, which is why Turkey has frequently complained about the “aggressive Persian nationalism” in the region. Turkey did march into Northern Syria in 2016, but it was only able to slow the advance of the Kurdish movement, which had won significant political autonomy there. The military fiasco revealed the desperate state of the Turkish army. And the political and economic costs of the invasion will increase over time. Turkey’s attempts to halt the Kurdish movement have been repeatedly frustrated. For many months government officials tried to convince the US to undertake the Raqqa operation against ISIS without the YPG and YPJ, Kurdish militias that are close to the PKK. But from the perspective of the US, EU, Russia, and Iran, Turkey was too unstable and insubordinate to rely on. Raqqa was subsequently liberated by a force dominated by the YPG/J. Now, though, Turkey is threatening to march on the Kurdish cantons of Afrin and Manbij in North Syria, which the US and Russia have long prevented. It has already begun shelling Afrin. But this has been the anomaly. For many months, there has been frustration in some quarters at the AKP’s inability to get its way with regard to the Kurds. Last fall, Abdülkadir Selvi, an intellectual very close to the AKP, said that Turkey had “lost its charisma” because the government persistently threatened the Kurdish Regional Government in Northern Iraq over its independence referendum, but could not change anything about the outcome. This kind of rhetoric has a clear political purpose. Blustering about the “dark forces acting against Turkey” wins the consent of right-wing cadres and grassroots activists. In addition, preventing an independent Kurdistan from forming in northern Iraq — regardless of how close it would be politically to the AKP, as in the case of the more conservative Barzani leadership — is a means to block intensified national consciousness among Kurds living in Turkey. And of course, the whole right-wing camp spews fire and brimstone when it comes to the independence referendum. Yet the problem here is the same one as with fascization in general: if it becomes clear that the aggressive posture is inconsequential phrase-mongering, the more legitimacy dwindles, which is founded upon that aggressive stance. This isolationism and adventurism, combined with internal instability, has made the economy very fragile. The collapsing tourism industry and declining capital inflows are just part of the problem. The post-Trump shock to the global economy and the Fed’s reversal of its quantitative-easing policy sent a significant flow of hot money into Turkey. However, these investments are very responsive to instability. When the US Federal Reserve definitively ends its loose monetary policy, Turkey will struggle to access foreign exchange markets. At the end of 2016, the Turkish Statistical Institute (TÜİK) significantly modified its data collection and calculation methods. As a result, growth rates suddenly increased, and Turkey could almost claim the highest savings rate in the world. The institute did not reveal how it changed its methodology, but critics have noted important inconsistencies. Neither the manipulated growth rates nor the pro-government media’s euphoria tricked or impressed big capital. Last September, the chair of Turkey’s largest industrial association, the Turkish Industry and Business Association (TUSIAD), declared that the nation had already reached the limits of consumption- and construction-based growth and demanded an immediate government response. A substantial part of the Turkish economy stays afloat thanks to credit expansion and business-friendly incentives, including a profit guarantee for major construction projects, tax exemptions, debt-restructuring agreements, and so forth. These measures have sharply increased the budget deficit, requiring adjustments to the debt ceiling. The Turkish lira was the worst performing currency against the dollar in 2017. Apart from pushing the inflation rate even higher, the lira’s depreciation will wreak havoc on the private sector, which crucially depends on imports for production. Industrial investment is falling, and construction investment continues to make up a substantial share of all investment. The productive sectors have dire expectations, and the interest rate remains too high. Erdoğan is furious that big capital has demanded an end to the state of emergency. Speaking to business leaders back in July, he made himself very clear: Are there any economic problems related to the state of emergency? We will use the state of emergency to intervene in workplaces that pose a strike threat. It is that simple. And in fact, big capital has been profiting from Erdoğan’s rule. The stock market (100) index last year had a real growth rate of 27 percent. Big corporations, like Sabancı Holding and Ziraat Bank, increased their profits by around 20 percent, while the largest of all, Koç, increased its take by 50 percent in the first half of 2017. But the economy’s overall performance and prospects for growth remain uncertain. Permanent political instability and aggressive foreign policy cause stagnation in foreign direct investment and adversely affect trade. A reversal in foreign capital flows or a series of defaults could tip the balance and doom the economy. Turkish capital worries that a sharpening of the AKP’s hegemonic crisis may bring on a convulsion that could threaten the entire system. Its European partners want a constitutionally secured, stable order that allows capital to accumulate smoothly. 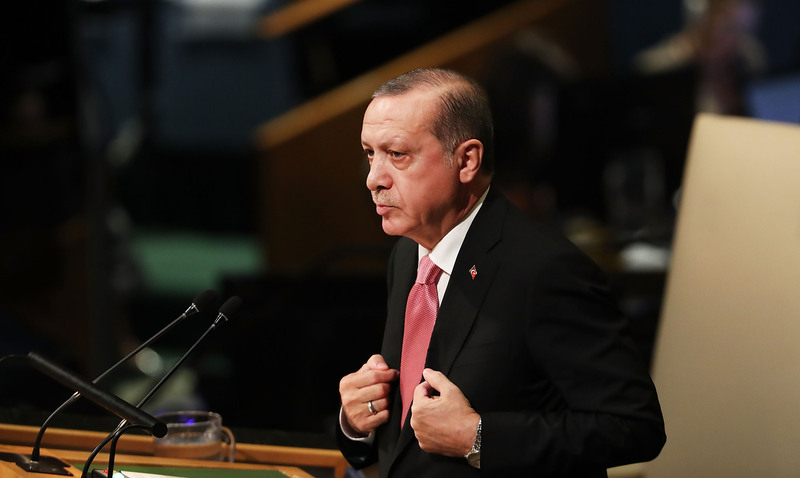 Erdoğan guarantees high profits, but he does so in a tenuous and crisis-prone manner. These fears explain why TÜSIAD and smaller business associations have been complaining: they urgently want a return to democracy, a normalization of social dialogue, closer relations with the European Union, pro-foreign capital policies, and the modernization and consolidation of the country’s customs union with the EU. Pressure from below is the main motor of the hegemonic crisis. A fascistic leadership that cannot crush internal opposition loses its legitimacy — controlling the country grants it one of its main sources of credibility. Thus, the price of failure constantly rises. Right now, it doesn’t seem like the AKP can establish complete control over Turkey. Last summer, the main opposition party, the Republican People’s Party (CHP), staged a “Justice March” and a “Justice Congress” that drew at least one million people. Ever since, many have spoken of the party and its leader, Kemal Kılıçdaroğlu, in terms of its “resistance.” But this perception of Kılıçdaroğlu is flawed and misleading. The CHP not only forms just one pole of the various movements against the Erdoğan’s rule — it seeks to channel people’s anger in ways that do not threaten the system. The CHP takes an extremely passive stance, and, barring any changes, it will not be able to take power, at least not by itself. The new phase of resistance began immediately after the government announced the results of the referendum. The many questionable and obviously fraudulent incidents during the vote motivated thousands to take the streets and declare the referendum illegitimate. These protests were mainly concentrated in western Turkey’s big cities, first and foremost Istanbul. But the decision to continue the demonstrations for over a week helped solidify the perception that the results were fraudulent. Indeed, the AKP and its propagandists never managed to establish a counter-narrative, and its base has not been effectively mobilized since. Even the anniversary of the July 15 coup attempt was celebrated in an uninspiring — if well-attended — fashion. While some left groups had belittled the “No” movement leading up to the referendum and the subsequent protests, arguing that “we cannot defeat fascism in elections,” the CHP participated in the movement in the hopes of getting a recount and because their own basis forced them to be more active. When the party leadership distanced itself from the street protests, parts of the youth wing called for “courageous steps.” They, alongside representatives of the liberal and social-democratic left wing, criticized the CHP’s leadership and accused the party of bearing some responsibility for the dire situation. In response, former leader and staunch nationalist-statist politician Deniz Baykal and Kılıçdaroğlu announced the party’s new strategic goal: taking the presidency in 2019. In other words, they did not oppose the new constitution as long as they can control it. In addition to the party base calling for a stronger stance against Erdoğan, big capital was also worked to strengthen his opponents. When Kılıçdaroğlu marched from Ankara to Istanbul, he had Turkish big business’s open support. But as the protest continued, space opened for resistance from many groups. A genuine popular dynamic unfolded, and Erdoğan, who first dismissed the march as futile, found it increasingly worrying. The CHP and Kılıçdaroğlu tried to present themselves as serious challengers in touch with popular social dynamics. Yet since they never wanted to radicalize these struggles, they quickly returned to trying to domesticate them. The Left took two dominant approaches to this new political environment. One faction, traditionally more republican-oriented groups, more or less accepted the CHP as the main pole of the resistance and worked alongside it, failing to recognize that the CHP still aims to control the protests’ autonomous potential. The other camp simply dismissed the dynamic altogether, seeing it as within the purview of the CHP and intent on steering clear of any influences from the party. Both failed to respond in a politically astute way. The Left’s task is to further the dynamics of democratic revolution and strengthen the social formations against both the established order and the CHP. This requires an independent stance that also engages with the people and popular dynamics on the ground — eschewing both ultra-radical declarations and actions that simply tail the bourgeoisie. There is another pole of bourgeois opposition to Erdoğan: Meral Akşener’s aforementioned party. Upon the party’s founding last October, the international media — from Foreign Policy and the Financial Times to Time — quickly hailed Akşener as Erdoğan’s only true challenger. Akşener frames herself as a strong woman who can win over nationalist, some religious, and economically liberal voters alike. She emphasizes her opposition to Erdoğan and her support for the rule of law. But her political past and present profile demonstrate that she is not a bright new face for a more just and democratic Turkey. In the 1990s, when she briefly served as interior minister, she allied with some of the most ruthless factions of the state during the dirty war against the Kurds. She is a staunch nationalist, as is the İYİ Party’s personnel. (“İYİ” is the symbol of the Kayı, a Turkic tribe from the eleventh century that plays an important role in Turkish nationalist mythology.) While Akşener expresses her opposition to the presidential system, she’s also made it clear that she wants to become president in 2019. The CHP and Akşener’s new party represent, respectively, the leftish- and right-liberal wings of capital. They may incorporate or ally with parts of the AKP or the Islamic camp that are fed up with Erdoğan. Big capital clearly supports these attempts. But none of these actors wants to strengthen popular movements or build a democratic alternative to Erdoğan and the established system. Whether or not the plans of big capital and its representatives will come to fruition remains to be seen. The situation is too unstable to make predictions. But the despotic state is in a deep, structural crisis. Despite ruling for fifteen-plus years, the AKP has not been able to reorganize the state in the way in which it would like to. The sharpening hegemonic crisis following the attempted coup produced chaos within and among the state apparatuses. While the army’s internal unity is disintegrating and former AKP opponents from the far right are settling within the state in an unstable alliance, countless FETÖ procedures increase distrust and uncertainty. The AKP’s leadership is tenuous. Capital is concerned about internal chaos, but, more importantly, about international isolation, the economy’s dire state, and the fact that around half the population will not consent to AKP rule. As a result, it’s trying to circumvent conflicts in Turkey as well as frictions with international powers in hopes of solving them in its own favor. Kılıçdaroğlu and Akşener both enjoy certain levels of mass support and will happily volunteer as alternatives to Erdoğan. Meanwhile, the social struggle has by no means died out. The dynamics the AKP intended to suppress through the state of emergency haven’t been quashed. Though strikes are now de facto illegal, workers are winning battles for improved working conditions and higher wages — as the struggles of Şişecam, Petkim, and Zonguldak workers over the past year indicate over the past year On the other hand, the fasts of Nuriye Gülmen and Semih Özakça represent just the tip of the ongoing struggle among the left-wing, public-sector workers fired after the coup. The People’s Democratic Party (HDP) is keeping its head up as well. Massive arrests of its MPs and grassroots activists have significantly weakened the party’s organizational power, and the planned two-month-long series of demonstrations across the country was not a great success. However, things look different in Kurdish regions. Tens of thousands of people in the HDP stronghold Diyarbakır still participate in rallies. The inability of the state to defeat the PKK in Turkey and the advances made by PKK-affiliated forces in North Syria, combined with the state’s ineffective adventurism in Syria and Iraq, constitute one of the ruling bloc’s greatest weaknesses. And there are more democratic resistance movements still, including the powerful feminist movement. It fought back against a planned abortion ban a couple of years ago and now focuses on promoting women’s self-determination and bodily integrity as well as stopping violence against women. The Alevi community continues to battle religious discrimination, particularly the growing Sunni influence in religion classes. They have been at the forefront of the fight against the new curriculum mentioned above. The desire for a democratic alternative manifested in the “No” committees before the referendum and the protests in response to the electoral fraud are very much in the tradition of the Gezi Uprising. These mass struggles and their demand for democratization should constitute the revolutionary left’s starting point — not procedural changes or presidential elections. These broader movements are built from the bottom up, using grassroots committees, forums, and workers’ groups, in which the people can develop their autonomy from capital and the state. The revolutionary Turkish left must actively intervene in these struggles in order to work toward a democratic republic, a demand that goes beyond rejecting Erdoğan and the presidential system and instead attacks the despotic state tradition itself. It was not the masses’ reactionary character or their stupidity that made them choose the AKP. It was (and remains) mostly the promise of economic growth and outrage at the military regime, the liberalization of culture concerning acceptance of Islam, and the feeling of exclusion. Even internal AKP studies indicate that a substantial part of its base disapproves of the party’s defamation of all opposition forces as terrorist as well as the extent of corruption, favoritism, and factionalism within the party. It was clear that the AKP, an advocate for and militant representative of neoliberalism, would never defend the interests of working classes. The more AKP-organized neoliberalism draws the nation into conflicts and crises, the more the alliance at the party’s base becomes fragile. Ultimately, the struggle between today’s dominant actors and the so-far diffuse democratic resistance will determine the character of the republic that will emerge, the position of workers and the oppressed within it, and whether leftists can further radicalize these struggles. It is a new year. The resistance cannot wait until 2019.